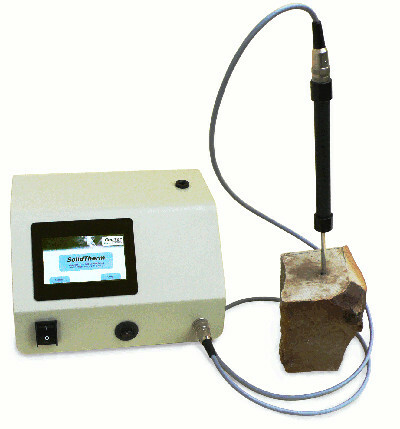 SolidTherm is a thermal diffusivity and thermal conductivity meter for solid materials like rock, ceramics and plastics. Its exceptional feature is the very low effort in time and work to prepare the samples. Only an impact drill is needed to drill a hole of 5 mm diameter and 70 mm depth into the sample. Since absolutely no surface processing is required, it is even possible to measure directly in bedrock or soil (in-situ) without cutting any samples. Thus, SolidTherm is also applicable for measuring unconsolidated rock and bulk material. There is simply to consider, that the sample or measuring environment must have a size of at least 100 mm in diameter and height. To perform a measurement, the measuring probe has to be inserted into the hole of the sample using a contacting agent. During the 2 minutes of measuring, the probe heats up (about 1 to 2 °C) and records the temperature reaction which is affected by the s urrounding sample material. In the following step, thermal conductivity and diffusivity are calculated based on the temperature graph. A smart touchscreen user interface guides the user intuitively through the measurement process leading to reliable results. Many thermal conductivity meters measure the temperature only a single point or along a thin line. SolidTherm measures and thus averages the temperature along the complete heating surface. This way, the measurement value is not dominated by local effects, caused by pores, grains or cracks, but characterized by the macroscopic behaviour of the material. Due to this fact, SolidTherm is well applicable to determine thermal conductivity and thermal diffusivity of inhomogeneous, porous, coarse-grained or unconsolidated materials and rock under dry and saturated conditions.